Download Hell or High Water in Digital HD from the iTunes store. Hell or High Water images are © CBS Films. All Rights Reserved. What would you do for your family? Would you kill someone or rob a bank? What if you were a career criminal about to lose the family farm due to crooked bankers who preyed on the elderly and ill? Would the end justify the means? 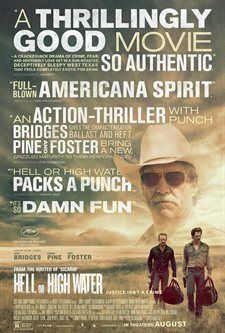 Hell or High Water, the new film from Director David Mackenzie (Asylum), gives you pause to think about all these questions and more. Toby Howard (Chris Pine; Star Trek Beyond) lost his mom a few months ago after a long illness. Now, he is about to lose the family ranch in West Texas to bankers who own the lien on the property. Toby enlists the help of his older brother, Tanner (Ben Foster; 3:10 To Yuma), a career criminal, to help him rob banks and launder the money through the Indian Reservation Casino so he can pay back the loan, put the land in a trust for his kids and contract with a large oil company to drill on the land. Ranger Marcus Hamilton (Jeff Bridges; The Big Lebowski) is a few weeks away from a forced retirement when he investigates a series of bank robberies where the thieves only target Texas Midland Banks and take less than $10,000 each time. Theorizing a plan, he figures where the robbers next stop will be and stake out the bank. While his theory isn't quite correct, he is close enough to lay chase when they hit up another bank and, eventually, he gets Tanner. The whole ordeal is gripping and intense. I'm not sure Jeff Bridges makes a bad film anymore, but if he does, he is usually the bright spot in the film. True to form, he plays his character well. Hamilton is funny, obnoxious, and insulting, with a layer of grief and heartache hidden underneath. The audience is apt to dislike him while routing for him the entire time, even though he doesn't necessarily deserve the cheering on. Ben Foster is terrific in his stereotypical role as the streetwise criminal. While we want to like him, there is something that just rubs against the grain and we mostly can't until we remember 1) he is breaking the law at his younger brother's asking all in an attempt to give Toby's kids a better life than they had and 2) He creates a diversion he knows will land him, at the very least, in jail again in an attempt to give Toby the chance to escape and see the plan through to fruition. Pine is adequate as Toby. He is the mastermind of the plan and is a loving father wanting to give his boys a better life, but he plays the character much the same as he plays every other role. Toby isn't as confident as Captain Kirk and doesn't have nearly as much swagger as James either, but the sameness of his characters makes Pine rather one-dimensional. I'm waiting for him to have a break out role and this film would have been the perfect vehicle but, sadly, I'm not sure he has it in him. Writer Taylor Sheridan (Sicario) once again proves he has a talent for story telling and takes us on a unique journey where we aren't always certain who are the bad guys and who are the good guys. Nothing is ever cut and dry in the worlds he creates and Hell or High Water follows this theme and makes the audience think. In an industry full of sequels and remakes, Sheridan is a fresh voice and a breathe of fresh air. For those looking for a good, thoughtful story with minimal car chases and battle scenes, Hell or High Water offers an intellectually stimulating movie experience. 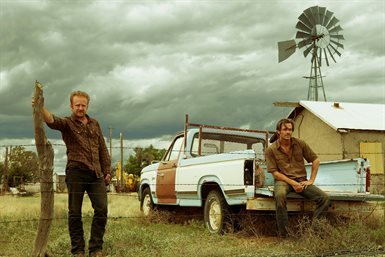 Hell or High Water images © CBS Films. All Rights Reserved.